NYC DOT celebrated BiketoberfestNYC by holding a Commuter Assistance Station at the 78th St Plaza in Jackson Heights. The Street Ambassadors caught up with market-goers shopping at the neighboring greenmarket held by GrowNYC and those headed to Travers Park. 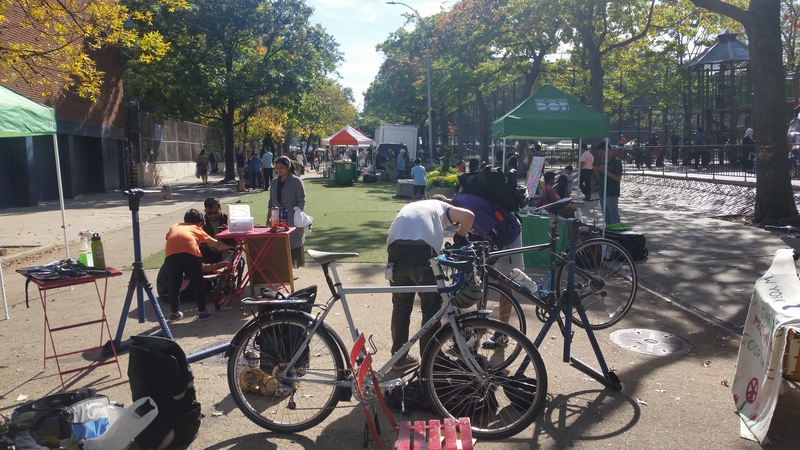 Folks visited our station which offered free bike tune ups provided by Mechanical Gardens, a guided bike ride co-led by DOT and Queens CB3, and free bike lights and bells. We received 250 comments on biking preferences and handed out 225 bike lights, 176 bike maps and 100 bike smart guides. There were also 30 bikes tuned up for free! The event was covered on NY1 News. Check it out here! Thanks to everyone that came by and to our plaza partner Jackson Heights Green Alliance for hosting us.